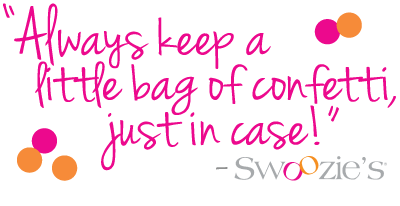 Always carry a little bag of confetti, just in case. The FALL season is here! From dinner parties to tailgating to outdoor entertaining to getting the house ready for the holiday season ahead, there are so many reasons to fall in love with fall. One of our favorite things about Fall is launching this catalog, which marks the arrival of our new gift & entertaining collections and the start of our annual Customer Appreciation Event. As summer days drift away and calendars start to fill up, time starts to go by a little more quickly. To help you host with ease (whether entertaining for 2 or 20) and give with gratitude (whether you need a quick hostess gift or a personalized present) we are excited to launch our new Need it Now shop in store. We have carefully curated thoughtful gift and entertaining ideas that you can personalize on-the-spot. Plus, we offer custom invitations and personalized stationery, so you can set the perfect tone for the party and always say thank you. We are so appreciative of our loyal customers, our Swoo Insiders. For even more up to date information on a lot of exciting and interactive events we have scheduled this fall for you, make sure you are following us on Instagram and on our email list. From Swoo-Torials to Fundraisers to exclusive Sip, Shop & Save events, we can’t wait to celebrate the season with you in store! Don’t live near a Swoozie’s? The party is always on at www.swoozies.com. At The Land of the Swoo, we are passionate about the fact that it has never been more important to recognize and celebrate life’s occasions. Those who visit this blog are women who continue to celebrate their children’s birthdays, their parents’ anniversaries and their daughters’ engagements. They would not fail to recognize a friend’s struggle, a neighbor’s battle with cancer or the etiquette of saying thank you. The Land of the Swoo was built for her, and we observe and listen to her. Though she may not always choose the luxury end of the spectrum, she continues to need options for celebrating life’s important events.